Turkey has nearly 5000 miles of coastline offering holidaymakers from Ireland an enticing mix of value for money, summer temperatures of 28C and higher, no less than 454 Blue Flag beaches and a choice of dipping their toes in the waters of the Mediterranean Sea, the Aegean Sea, the Sea of Marmaris or the Black Sea. This favourite holiday destination, which sits across Europe and Asia, also offers a fantastic mix of holiday accommodation, a heady mix of tasty food, from international cuisine to traditional Turkish dishes, plus an abundance of natural beauty. In 2019, Turkey is set to be one of the most popular destinations for Irish holidaymakers with the majority of people taking a holiday in Turkey heading for a beach resort. If you haven’t yet experienced a beach break in Turkey or are keen to explore a different part of this exciting country’s coastline, we take a look at four holiday hot spots in the country’s south-west region. This port city and tourist resort on Turkey’s Mediterranean coast is popular with Irish holidaymakers due to the area’s six miles of breathtaking beaches and vibrant nightlife. Some of the best places to stay in Marmaris – also known as the Turquoise Coast – offer wonderful views of the harbour. For the full Marmaris experience, however, it’s advisable to stroll the colourful promenade, take a gület cruise along the coast to Fethive, visit the magnificent castle and gaze down on the marina. Marmaris’s old town is based around the castle. This is where you’ll find the oldest and most traditional buildings plus a bazaar that sells everything you could possibly imagine, pretty gardens and a notable mosque. Marmaris is also a great base for day trips to Dalyan, Dalaman, Ephesus and Pamukkale. It’s also possible to take a ferry or hydrofoil across to the Greek island of Rhodes. Alternatively, Sedir Island in the Gulf of Gökova is another picture-perfect location with a collection of Roman ruins, including an amphitheatre in the shadow of olive groves. Sedir Island is also home to Cleopatra’s Beach, where legend has it that the ancient Egyptian ruler once swam in the clear blue waters. Another notable beach in the area is Icmeler. With its fine golden sands and especially stunning waters, this is a spot that’s particularly great for scuba diving and fishing. Icmeler also has a canal running through the town that is lined with shops and cafes on either side. Alternatively, visit the mountainside village of Nev, with its white-washed houses and local eateries offering home-cooked meze and kofte with yoghurt. This purpose-built tourist resort has 10 miles of pristine, fine white sand beaches fringed by shady pine trees that slope gently to a calm stretch of the Mediterranean Sea. Luxury tourist facilities in Belek, which is about 25 miles east of Antalya, were developed in the 80s for the golf market. As a result, it has a significant number of high-class hotels offering visitors a wealth of facilities, from saunas and spas to floodlit tennis courts, play areas and well-equipped fitness centres. In addition to its world-class golf courses, some of which have hosted international tournaments, and spectacular beach, Belek is a nature enthusiast’s paradise. This is due to Belek Beach being the site where loggerhead and green turtles lay their eggs in the summer, with their young hatching a couple of months later. There are also more than 100 species of bird living near the Kursunlu Waterfall, which is just a 30 minute drive from the centre of Belek. Alternatively, the ancient city of Perge and the amphitheatre of Aspendos are also nearby. 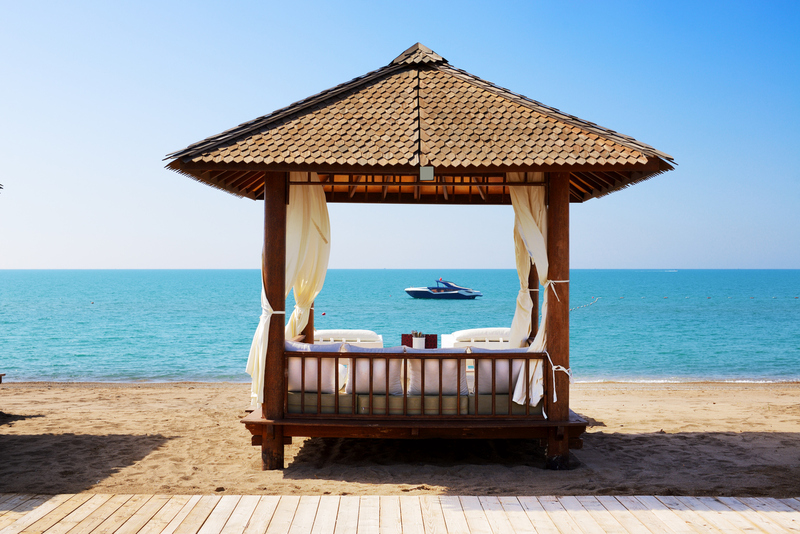 Often described as Turkey’s answer to Las Vegas, Lara Beach – which is a 25 minute drive from Antalya on the Mediterranean coast – is known for its luxury hotels designed to look like famous landmarks, such as The Kremlin and the Titanic. However, the beach steals the show here. Award-winning Lara Beach is the perfect place to enjoy the hot Turkish summer temperatures and its Blue Flag status and warm shallow waters make it particularly great for families. In addition to the long stretch of public beach, the hotel sections guarantee lots of amenities, such as umbrellas and loungers as well as stylish beach bars serving snacks and cocktails. The local Troy Aquapark is also perfect for keeping kids (and big kids) entertained – with slides, rides and dolphin shows on offer. 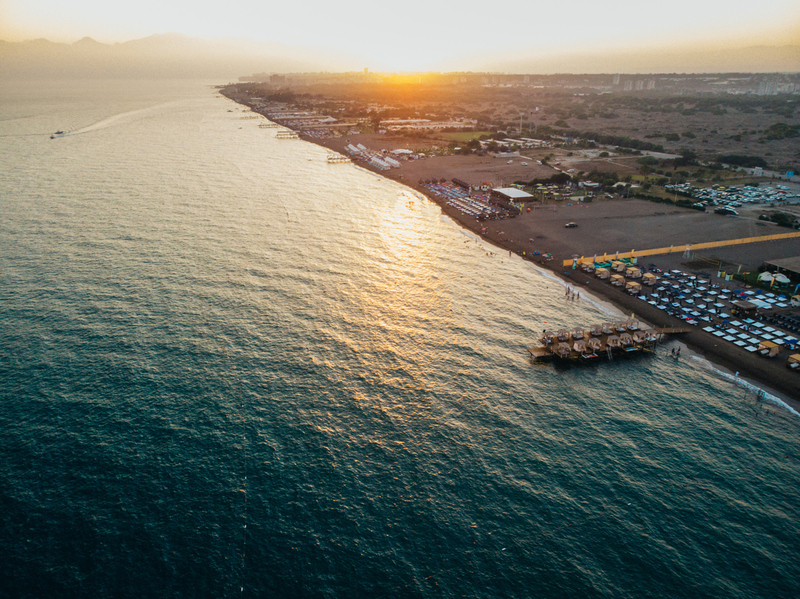 Outside the resort town, Antalya – the largest city on the Turkish stretch of the Med – offers a wealth of attractions, including the well preserved old town of Kaleici. Alternatively, take the tram along Antalya’s seafront to the town’s museum, which is packed with Greek and Roman relics. 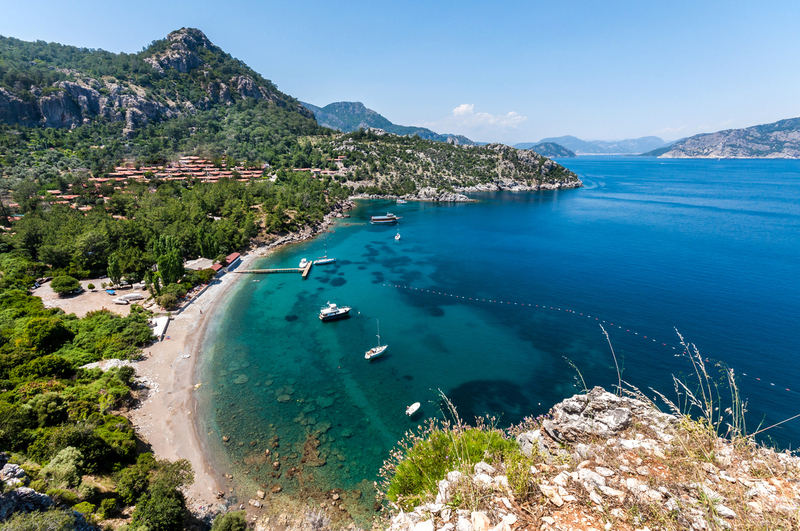 If it’s beaches you’re after, then Oludeniz will not disappoint. Nestled at the foot of the Taurus Mountains between Marmaris and Antalya – where the Aegean and Mediterranean meet – this popular village is home to one of the most photographed coastal views in Turkey. 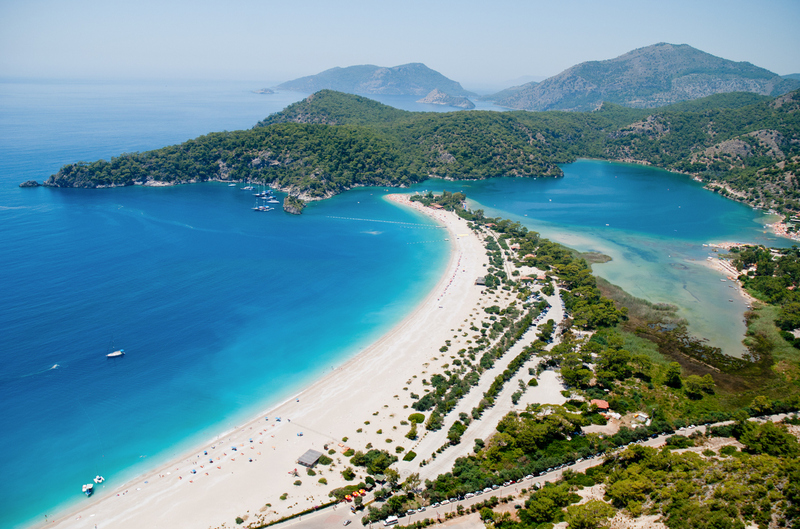 Of the 10 beaches in or near Oludeniz, the most noted is Kumburnu (which is more commonly known as Blue Lagoon). Separated from Belceğiz Beach, the resort’s free-to-use main beach, by a sand bar and narrow channel, the family-friendly Blue Lagoon Beach is noted for its crystal clear shallow waters, which make it ideal for swimming and paddling. Canoes and paddle boats can also be hired to explore the rocky shores of the inner lagoon and search for mussels. Alternatively, put on a snorkel and discover the myriad of tiny fish that start their life in these sheltered waters. Although this beach, which is part of a national park, charges an entrance fee, those who choose to make the most of its picture-perfect golden sand can use the showers, changing rooms and toilets available. Food and drink is also available at the café situated at the edge of the lagoon, while shade is also provided by the national park’s lush foliage. Alternatively, rent sunbeds and umbrellas. For those who want a little more action, Oludeniz is one of Turkey’s top destinations for tandem paragliding. Nearby is also the starting point for the Lycian Way walking trail – a 300 mile route from Fethiye to Antalya that takes in rocky coastlines, deserted beaches, pine forests, mountain peaks and ancient ruins. For a less energetic excursion, why not take a boat to the quiet and unspoiled Paradise Beach? The sand is not only inviting, but the waters surrounding this ideal spot are perfect for diving and snorkelling.